I first learned about the School of Hard Knocks from a fellow travel blogger at Our Travel Lifestyle and made sure to book a visit to the Royal Selangor Visitor Centre for our upcoming visit to Penang, Malaysia. Royal Selangor is a Malaysian pewter manufacturer and in addition to a lovely retail store, the visitor's centre offers tours and workshops. 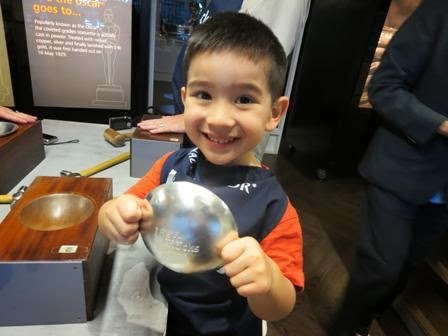 Their School of Hard Knocks offers visitors the opportunity to make your very own pewter bowl. After checking in, we headed upstairs to the workshop. Each of us was provided with a Royal Selangor apron and a round, pewter disc. Our first step was to emboss our names onto our bowls with a small hammer and embossing letters (Mark wasn't paying attention to the instructions and his 'M' ended up being upside-down). The next step was the really fun part - placing our pewter discs over a wooden mould then banging away at it with a mallet until it formed the bowl-shape. B and his grandparents needed a little bit of help but we were each able to bang out our bowls in about 25 minutes. It was a fun family activity and well suited to our five-member, three generation group. B absolutely loved being able to hammer on his bowl and make plenty of noise in the process! At the end of the class, we each left with our apron as a memento, our own hand-made pewter bowl and a completion certificate.